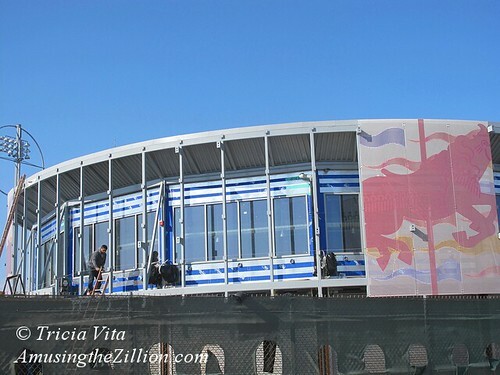 While Coney Island’s Cyclone, Wonder Wheel and other amusement rides are awhirl on weekends and the Boardwalk eateries and shops are open daily– weather permitting– construction continues on the storm-damaged pier, the new Steeplechase Plaza and new buildings on Surf Avenue. Renovations are also underway at the New York Aquarium, Coney Island USA and Nathan’s Surf Avenue location, all of which expect to reopen by Memorial Day Weekend. 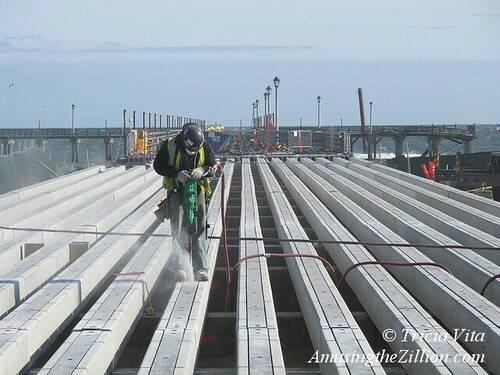 The post-Sandy reconstruction of Steeplechase Pier is back up to speed after a construction barge sank on April 13. Last week, sources told ATZ that the damaged barge had been repaired. This type of barge has four legs (called spud poles) which telescope for mooring and one of the spuds had cracked, which caused the barge to submerge. On Monday, while workers continued construction of the pavilion that will be the home of Coney’s antique B&B Carousell, an Atlas Van Lines truck arrived from Ohio with the restored ride including 49 of its 50 hand-carved wooden horses. The first restored horse had been put on display by the NYCEDC at the Coney Island History Project last May and named “Ravishing Ruby.” Coney’s last hand-carved carousel was saved from auction in 2005 when the City purchased the ride for $1.8 million. The B&B is currently being assembled in its new pavilion in Steeplechase Plaza and is expected to open on Memorial Day Weekend. 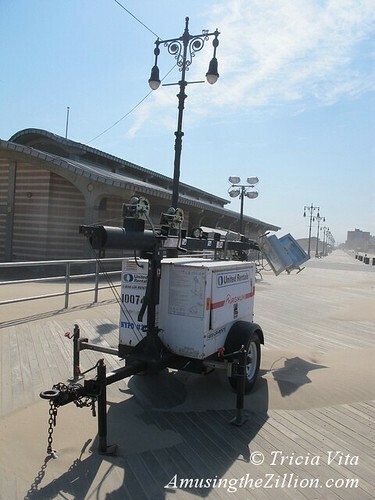 The Boardwalk’s distinctive twin cast iron light poles, which were installed with $1.2 million allocated in 2004, have not been operational since Sandy. These portable trailer-mounted lighting units were brought to the amusement area more than a month ago. Meanwhile on the north side of Surf Avenue, construction is underway on a building for Applebee’s, among the first of several new franchises and chains coming to Coney Island’s main drag. 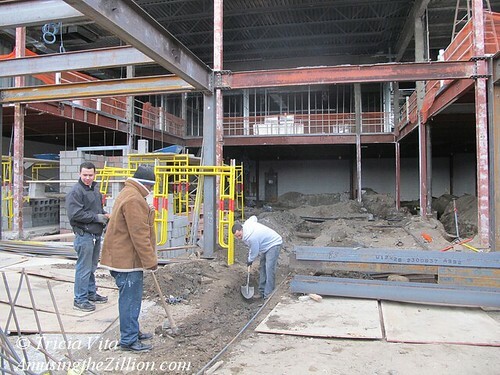 Crews are working seven days a week with a target opening date in mid-June. on April 25, 2013 at 5:57 pm | Reply M.
Love the updates. Any news on Wet Willie’s? One of the only new businesses planned that I’m actually interested in. Tricia, once more you make me home sick for Brooklyn. Can I ask if the restoration of homes in Brooklyn and Queens since Sandy is making progress? Most important part is the Carousel Pavilion will be open year round with an adjoining cafe and Applebees will be open year round as well, Coney is finally evolving into a year round destination which was the mission of the CIDC. Slowly but surely Coney is changing, Great info, Thanks! For now, the B&B Carousell has the same schedule as Luna Park, which has the contract to operate it and closes at the end of October. Whether the carousel will be open year round like the Central Park Carousel or for eight or so months of the year like the Prospect Park Carousel has yet to be announced. According to the RFP, the hours are determined by the concessionaire and Parks Dept. It does not state that the carousel must be open year round. It will also have an adjoining cafe which will likely be open year round as well. Very important for the year round future of Coney.